1. 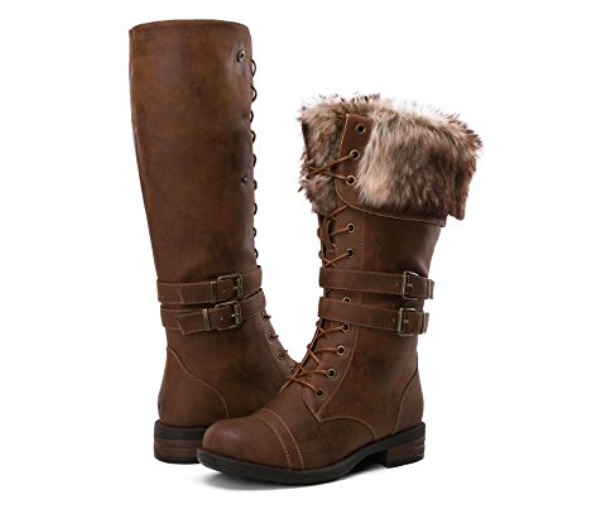 Furry lace-up boots that'll win best in *snow* for combining serious warmth and trends. 2. Satin and velvet waterproof Timberlands to combat cold weather with updated classics. Get them from Nordstrom for $169.95 Sizes: 5.5–11. Available in four colors. 3. Inexpensive snow boots with fluffy faux wool lining that'll save both your feet and your Starbucks peppermint mocha budget. Get them from Amazon for $12+ Sizes: 4–11. Available in five colors. 4. Metallic Chelsea boots so you can stomp out snowy days that cause unfashionable ruts. Get them from Amazon for $21.99+ Sizes: 6–11. Available in three colors. 5. Heeled vegan leather boots, because clunky shoes deserve to get ~kicked~ out. 6. Crushed velvet boots for the perfect accessory to look dashing in the snow. 7. Sturdy weatherproof snow boots so you can tell snowy storms to *puck off*. Get them from Amazon for $29.99+ Sizes: 5.5–11. Available in three colors. 8. Perforated Chelsea boots that'll swirl up a storm (but still keep you warm). Get them Boohoo for $23 (originally $46). Sizes: 5–10. Also available in black. 9. Slouchy faux-suede mid-calf boots to walk the walk without any major ~slip ups~. Get them from Amazon for $19.99+ Sizes: 6–11. Available in four colors. 10. Suede lace-up heels with plenty of grip to tell those damn slippery sidewalks who's boss. Get them from Amazon for $12.69+ Sizes: 4–10.5. Available in three colors. 11. Faux suede combat boots so you can put your foot down on perilous treks to work. Get them from Forever 21 for $34.90 Sizes: 5.5–10. Also available in black. 12. Heeled animal print booties to take a walk on the wild side in a winter wonderland. 13. Weatherproof over-the-knee boots for a way to turn heads — even Frosty's if he had a neck. Get them from Target for $32 (originally $39.99) Sizes: 5.5–11. Also available in black. 14. A two-in-one combat boot with a sock ankle warmer so you never get ~cold feet~ about leaving the house. Get them from Amazon for $21.81+ Sizes: 5.5–11. Available in three colors. 15. Genuine shearling Uggs, because if these puppies won't keep your toes cozy than you need to go see a doctor. Get them from Nordstrom for $249.95 Sizes: 6–12. Available in three colors. 16. Chunky heeled boots that'll never let you down — onto the ground, that is. 17. Velvet sock boots so you always feel suave, even when avoiding sleet. 18. Fashionable fringe boots for a way to *sleigh* every day, no matter how low that thermometer drops. Get them from Amazon for $39.99 Sizes: 6–9. 19. Luxurious velvet ankle boots with elegant florals, because we all know Punxsutawney Phil is going to see his shadow so we'll have to grow our own damn flowers. 20. Over-the-knee boots that'll be tough on ice and easy on the eyes. Get them from Nordstrom for $124.95 or Amazon for $88.17+. Sizes: 5–10. Also available in olive. 21. Fleece-lined, faux-suede boots so your feet are more insulated than Ralphie Paker bundled by his mom. I can't put my arms down!! Get them from ModCloth for $69.99 (available in sizes 6–10) or Amazon for $49.76+ (available in sizes 6–11 and in four colors). 22. Metallic Dr. Martens for proof that pink can be tough — especially on slush. Get them from Zappos for $120 (also available in silver) or Amazon for $92.71+ Sizes: 5–11. 23. Versatile heeled booties with colorful laces, because yellow should not be the only shade we see in the snow. 24. Classic over-the-knee boots to turn your heel on dressing blander than un-spiked eggnog. Get them from Amazon for $42.99 Sizes: 6–11. Available in five colors. 25. Furry ankle boots, because if you're forced to interrupt your holiday movie marathon for work, you might as well look cute. Get them from Forever 21 for $37.90 Sizes: 6–10. Also available in black. 26. Cheerful heeled boots that'll tell you to get a ~grip~ when you test out the salted roads. Get them from Amazon for $18.25+ Sizes: 6–10. Available in four colors. 27. Shearling leather waterproof boots with an adorable pompom and wool lining for an overall meltdown over how you really can have it all. Get them from Nordstrom for $239.95 Sizes: 5–11. Available in three colors.